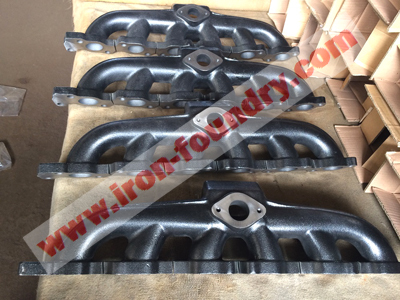 Our Dandong Foundry has produced cast iron exhaust manifolds over 10 years, so we have produced many types of iron manifolds, but we also experienced long time delivery delay from time to time. 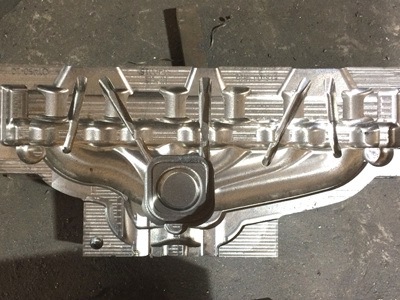 Our clients were wondering why there will be delivery delay for manifolds, not for other casting products. Herein, I will try to explain it for you. One type of manifold may need 3 to 5 sets of metal patterns, so the pattern making will need much longer time than other patterns. Other castings may only need 1 set of patterns. So, other casting pattern may only need 20 to 30 days, but the metal patterns for one manifold may need 45 to 60 days. Of course, if the manifold is very simple, then it will not need so long. When pattern completed, metal foundry will start to make sand shells and cores, one molding machine can only use one set of pattern, so making sand molds will use longer time than others. If other molding machines are busy for other products, it is difficult to arrange several molding machines to work at the same time for manifold. When samples come out, but find some dimensional problem or casting defects, then we need to modify their patterns again. So, all the previous processes will need to be repeated again. After rough castings completed, the machining will need some time too. Machining to manifolds is also complex, so will need some machining fixture. In China, the most of machining fixtures will be made by our own machining workshops, so the technical staff will need to see the real samples, then design the fixture. It is difficult for them to design the fixture by drawings. All these factors will cause very long leading time for patterns and samples. The rich experience may save some time for gating design and defects, but still need longer time than other castings. During initial orders, some casting defects and production problems will come out. In order to reduce the defective rate, our foundry must improve the gating system step by step, by doing so, the production time will be run out. Most of cast iron exhaust manifolds will have big inside cavity, which will be made by big sand cores. The sand cores will cause air venting problem. The air in the sand cores will come out and go into the hot irons, so will cause big casting defects. Iron foundry has to solve this problem by some methods, this will need time. Moreover, because one manifold will occupy 3 to 5 molding machines, this will cause production problem. If other molding machines have been occupied, and those orders are also urgent. The production will be very difficult. 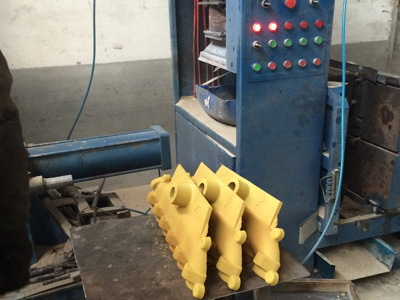 Sometimes, our foundry will use several molding machines to keep production for manifolds. You must have been tired to hear these reasons, and want to hear something useful. Firstly, the clients should give the manufacturers enough time for pattern making and samples. They can not be completed too soon, even if we wanted. Secondly, the clients should give enough time for initial orders. The initial orders will take longer time than the normal orders. Thirdly, if your suppliers can not deliver them quickly, you must consider to build some stock in your supplier's foundry, or in your own warehouse. There are not many iron foundries in China, who are willing to produce manifolds. Among them, there are only few foundries, who could produce them very well. If you are buying cast iron manifolds from China, hope these information could be helpful for you to understand, and avoid the loss caused by delivery delay problem.